Frank Lambert, professor of history at Purdue University, does an excellent job of surveying this complex topic over a 200-year period. He does so thoroughly, yet concisely, in only 296 pages. While making generalizations at times, he often illustrates his points with quotations from original sources of the time period. He begins by criticizing extremists on both sides of the issue, and proceeds to present a balanced approach. However, as I will explain at the end of this review, he shows his bias at the end. 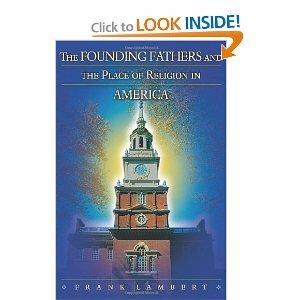 Lambert’s thesis is this: America WAS first settled by people who wanted to make it a Christian nation, whether Puritans in New England, Anglicans in Virginia, or Quakers and others in Pennsylvania. These early founders had a vision of making America “a city on a hill,” a model Christian commonwealth. However, two major influences led the founding fathers to establish a government that separated church and state. These two influences were the Enlightenment and the Great Awakening. Men like Thomas Jefferson and Thomas Paine, who were influenced by the Enlightenment, felt that men should be free to use their own reason in matters of religion. The Baptists and others who benefitted from the rapid growth of “free” churches in the Great Awakening were persecuted by established churches and wished to have no established church, so they joined with men like Jefferson in calling for separation of church and state. Lambert shows that there was great division over these issues, and gives interesting anecdotes and quotations from both sides. He quotes frequently from religious leaders on both sides of the issue. However, near the end of the book he spends much more time quoting Republicans like Thomas Jefferson and James Madison, and gives little space to Federalists like George Washington and John Adams. At one point, on page 161, Lambert implies that John Adams was a deist, even though biographies of Adams have shown him to be a devout Christian with a Puritan heritage. Lambert shows his view in his conclusion, as he criticizes accomodationists such as Judge William Rehnquist and “religious right” preachers like Pat Robertson. While Lambert gives both sides of the argument, he clearly leads the reader to his own separationist interpretation. Because the book is so full of useful information, I highly recommend it as a textbook on the subject, but let the reader understand that Lambert has his own bias, too. Watching the returns and waiting to see who will become the next president is about as compelling as TV viewing gets. It’s no secret that millions of Christians went to bed with sour stomachs last night. Many, though I am sure not all, who would identify themselves as social conservatives and followers of Jesus were outspoken in our hopes that the incumbent president would have a new career beginning in January. Since that didn’t happen, what are some appropriate responses to a second term for Barrack Obama? Pray for the president – 1 Timothy 2:1-2 (NKJV) 1 Therefore I exhort first of all that supplications, prayers, intercessions, and giving of thanks be made for all men, 2 for kings and all who are in authority, that we may lead a quiet and peaceable life in all godliness and reverence. Preach the Gospel – A concern I have had for some time is that a lot of Christians behave as though getting the “right person” elected is THE ANSWER for America. Hello! It’s not! It never was! God changes people from the inside out. He changes the heart. I am not aware of anything that the government can do that can bring spiritual regeneration to people. Only the Gospel of Jesus Christ can do that (Titus 3:5). People who have experienced the grace of God through Jesus Christ can be a powerful force for transforming North American culture by radical obediennce to the Great Commission (Matthew 28:18-20). That is really the only way that God has ordained to change societies. I want upright legislators and leaders, but if the Gospel is not the focal point of the energy of Christians we will share the largest part of the blame for the disintegration of North American culture (Matthew 5:13-16). See People through God’s Eyes – I think a less angry, less shrill, less paranoid perspective of our fellow human being would be extraordinarily helpful. It is easy to have a hateful attitude toward people who don’t share our worldview and our faith, but where in Scripture are we given permission to think and act that way? And what is the good in that? The truth about me is that I was a wreck of a person before God’s grace found me, and I still struggle and fail and have absolutely no right to look at anyone else’s failures as being more scandalous or wretched than mine. We are all in the same messed up situation–that is not to minimize sin, or to deny it’s severity–just to say that I don’t belong to God by my right but by His mercy! 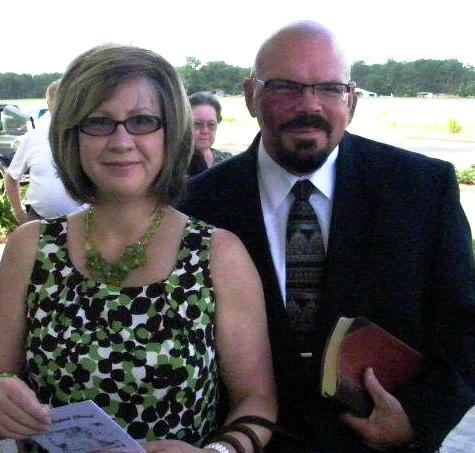 Share hope – I woke up today, November 7, 2012 with hope, because God is Great and greatly to be praised (Psalm 48:1)! I woke up determined to have my life count for a great purpose because God is a great God! I woke up today convinced that America’s greatness has more to do with the faithfulness of me and all the other Christians I know and churches they are part of and our obedience to God and commitment to the truth of Gospel than what transpired in the presidential election. Here are two maps of the USA. 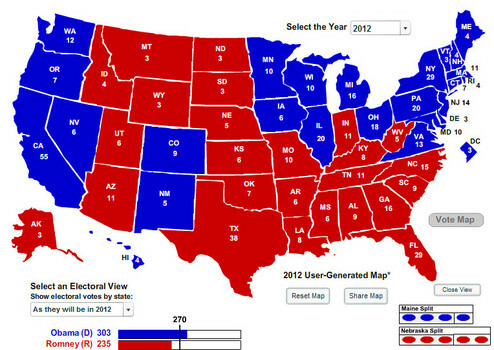 The first compares the states that voted for Obama (blue) and Romney (red) in the 2012 presidential election. 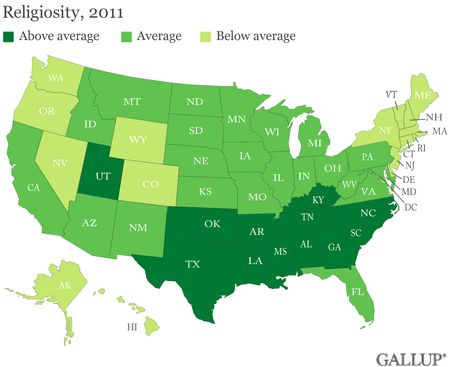 The second shows states that are very religious (dark green), average (green) and below average in religiosity (light green). It is interesting that 100% of the “above average” religious states went for Romney, and 14 out of 16 “below average” religious states went for Obama. Exit polls show that people who go to church regularly supported Romney by large margins, and people who never go to church supported Obama by large margins. Religion was not the only factor in the election, as there were many “average” religious states that went for Romney and two “below average” states (Wyoming and Alaska) that went for Romney. This is because there are two kinds of conservatives: social conservatives and fiscal conservatives. Wyoming and Alaska are definitely independent-minded, fiscally conservative states. But the map does indicate that despite all the focus on the economy in this election, the differences between the candidates on the social issues that religious people care about, especially abortion and traditional marriage, made a huge difference in how people voted.